It’s official - Doyle Brunson is coming to London. The Godfather of poker has agreed to be the keynote speaker at this year's conference, which is anticipated to be the biggest affiliate event of the year. The legendary poker player will make a rare speaking appearance on the first day of the conference, Friday October 5th at 1 pm. Doyle will be talking about his extensive experiences in poker and how the poker industry has evolved over the five decades he has been playing. DoylesRoom.com is launching its new-look site on the 1st of September focusing specifically on the UK and rest of Europe. The revamped site, which is an international hub for Texas Hold’em and other popular poker games, considers CAP Euro as one of the best platforms to communicate with European affiliates. In addition to a story or two, Doyle will be having autograph sessions and photo opportunities on the 5th and 6th. 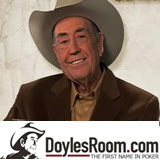 DoylesRoom.com has received numerous industry awards over the years for its innovative tournaments, responsive customer service and the unique opportunity to play against the Godfather of Poker in the one and only original Bounty Tournament where players can pick up a cool $25,000 by knocking out the three celebrity bounties. To become part of this exciting and fast growing online poker community, simply go to www.doylesroom.com and register. CAP Euro Barcelona, Europe’s premiere networking event for affiliates and casino operators in the iGaming industry, will be an exciting, interactive three day event taking place on the 5th, 6th and 7th October.